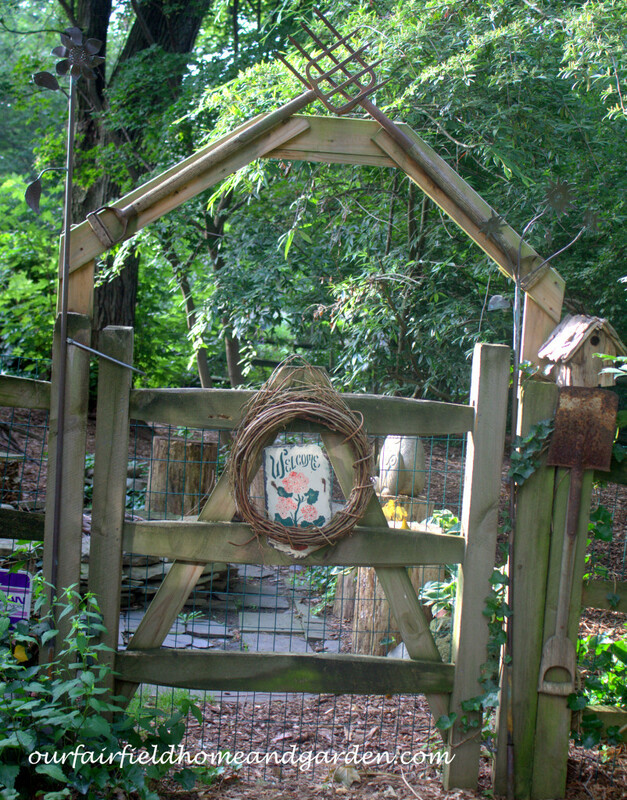 In the past month, we have hosted four garden tours here at Our Fairfield Home and Garden! 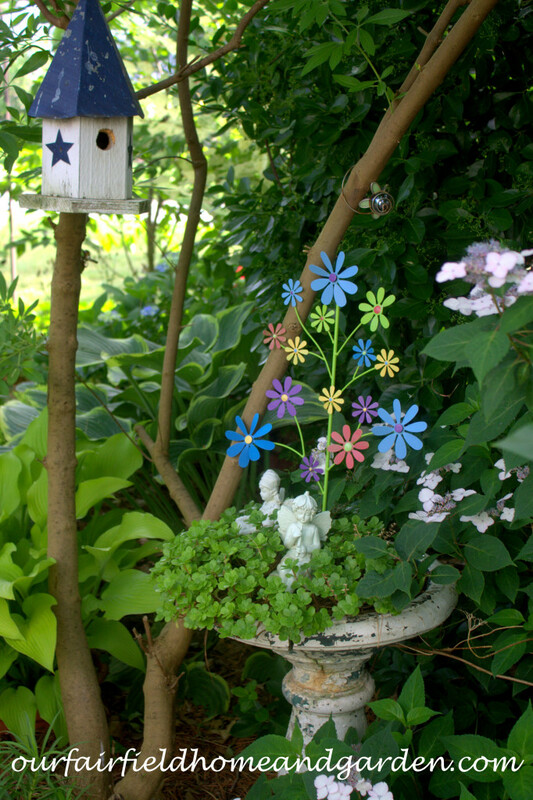 That’s a lot of keeping things tidy – sort of like when you have your house on the market and everything has to look perfect all the time, but on the outside. 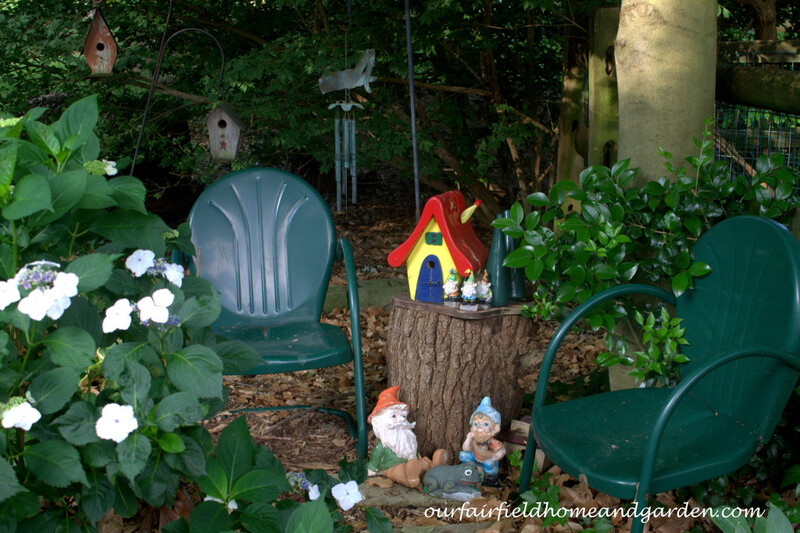 Now it is time to relax and enjoy the summer garden. Since I couldn’t have you all over for one of the tours, I will bring a special one to you! 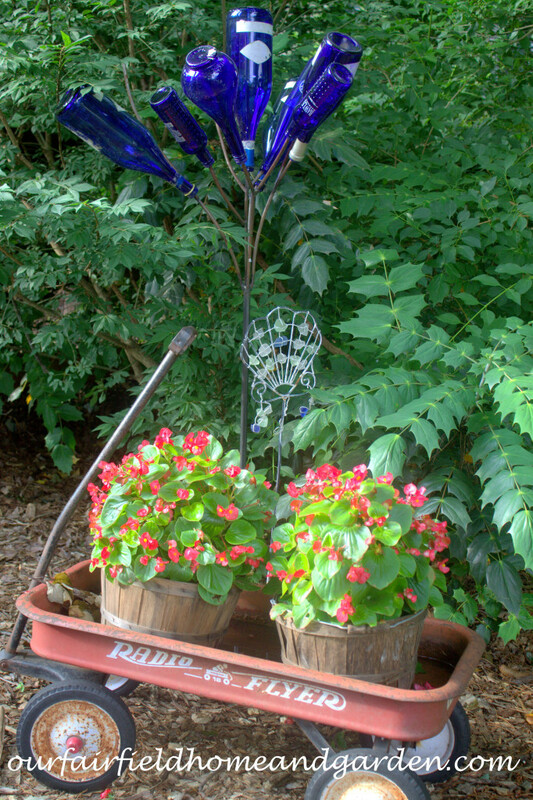 Lots of pictures ahead, so cozy up with your favorite cool beverage and come on a stroll with me. 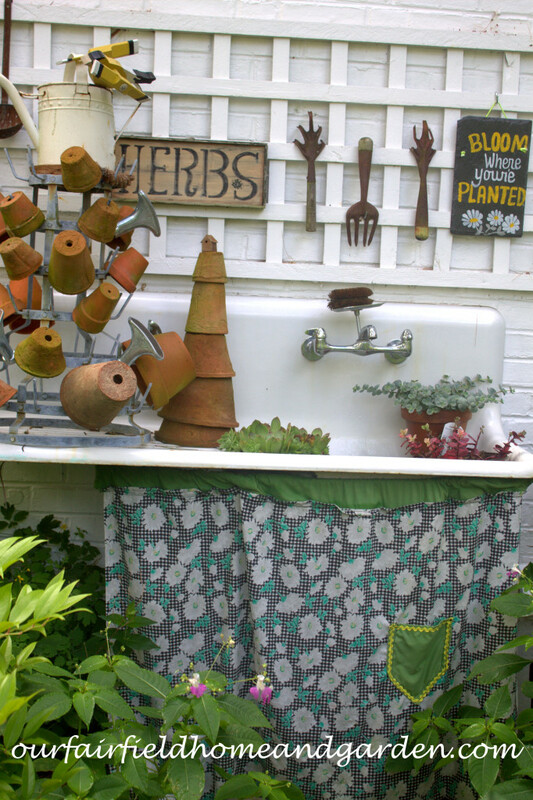 This garden is now eight years old and a lot has happened in that time. 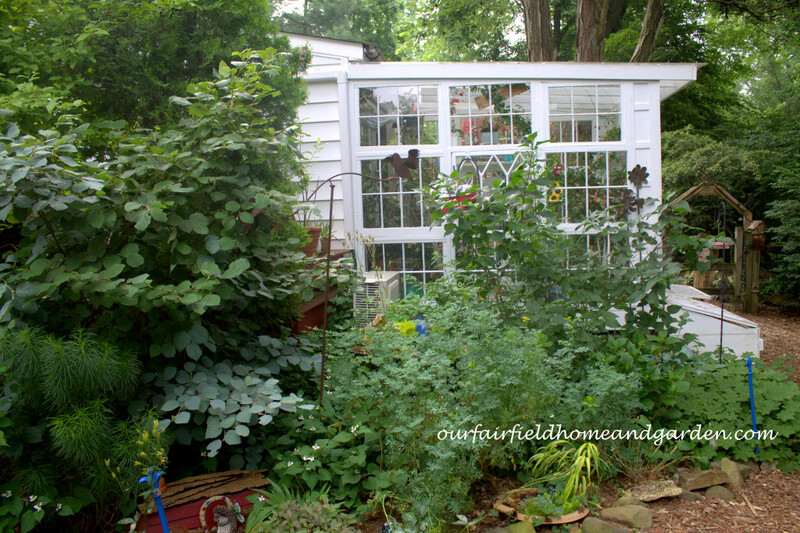 The back and side yards were just swaths of pachysandra and English ivy when I started. 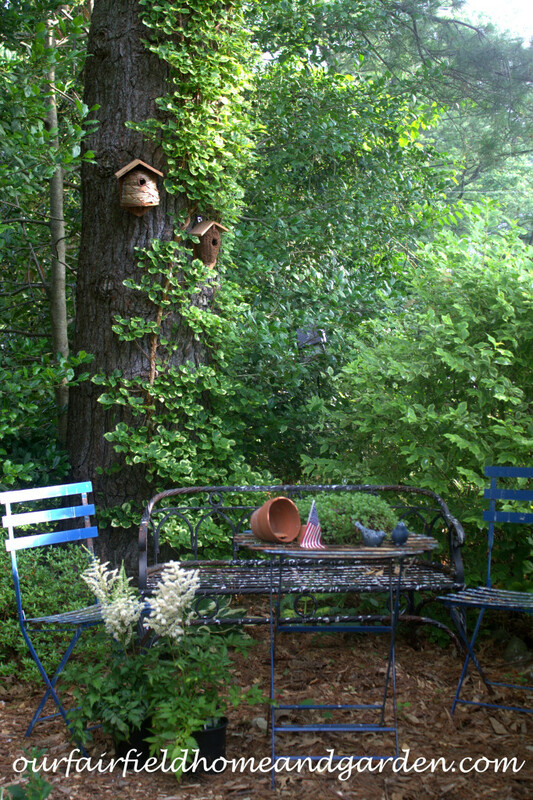 Stately, mature trees spoke to me and I have created gardens around and under them. Plantings have grown over time and now this little half acre is starting to look like I had dreamed it when we first moved. 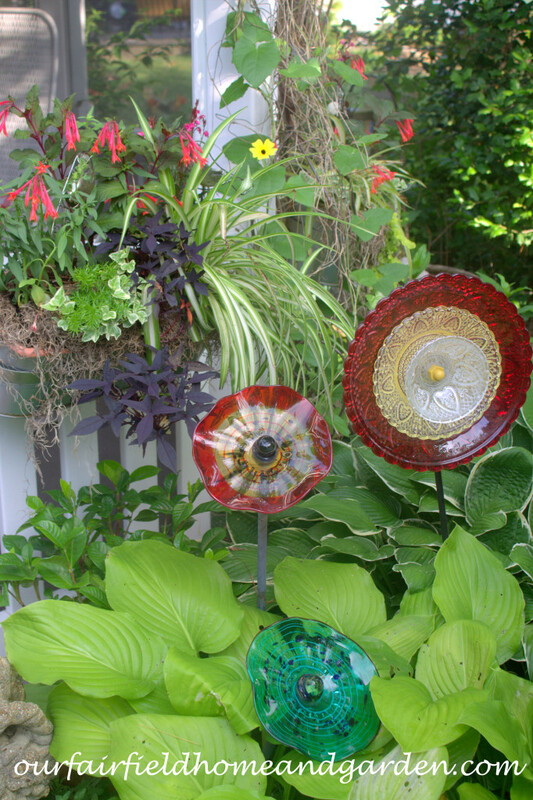 I hope you enjoy your time in our garden today and come back to visit again soon! 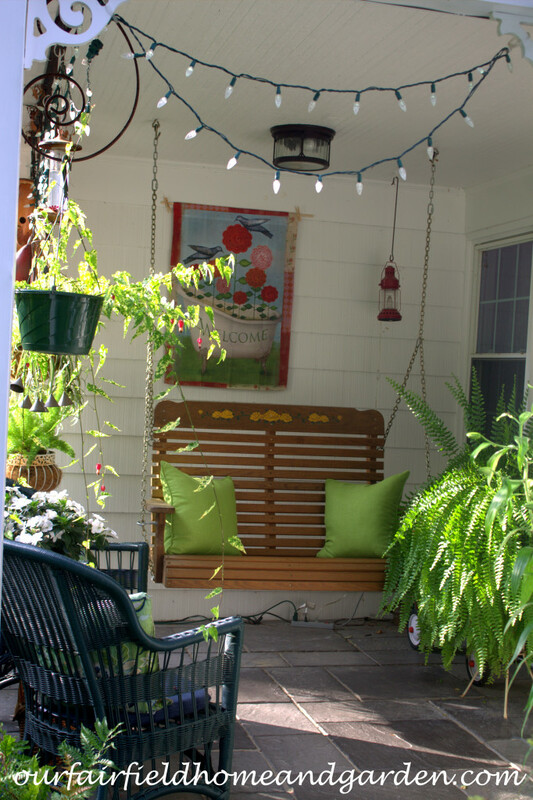 Porch Swing ~ my summer office! 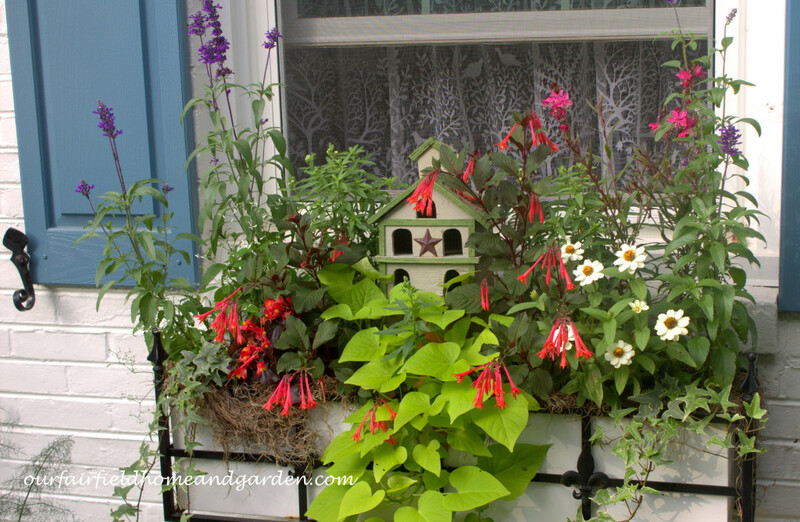 Summer Windowbox with salvia, zinnias, guara, fuschia, ivy, snapdragons and sweet potato vine. 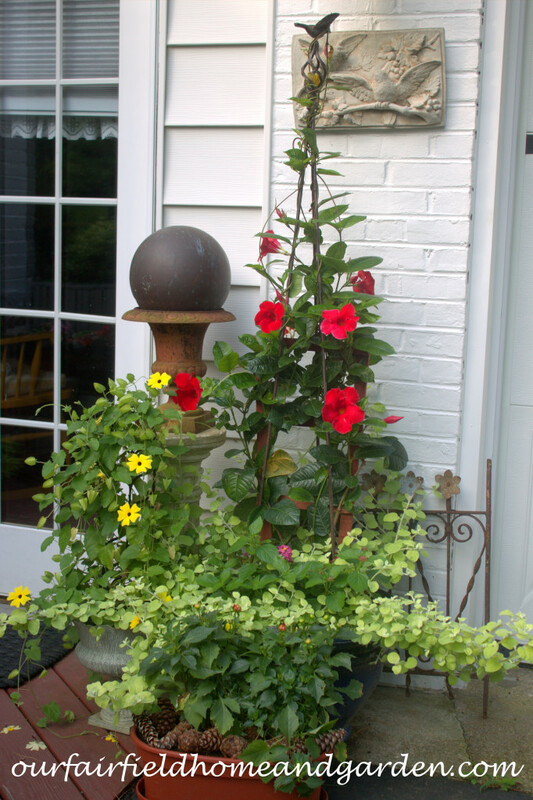 Container Plants ~ mandevilla, lantana, licorice plant, dhalias and black-eyed Susan vine. 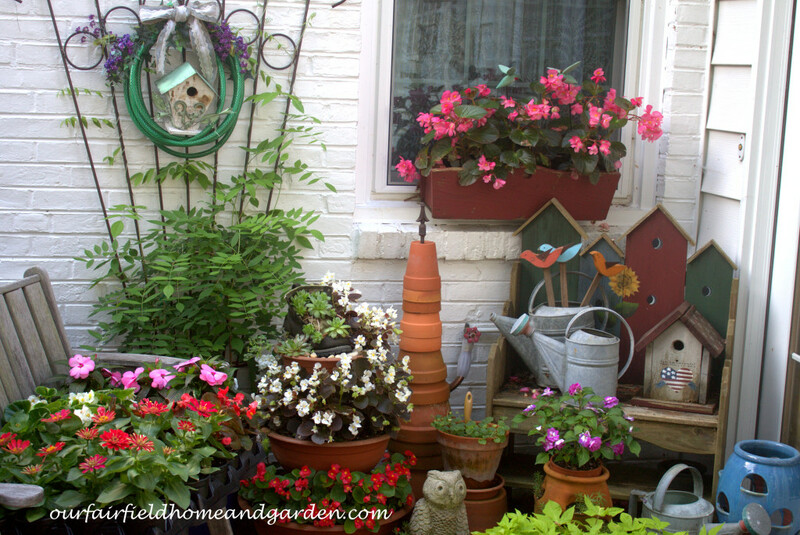 Kitchen Deck bursting with blooms! 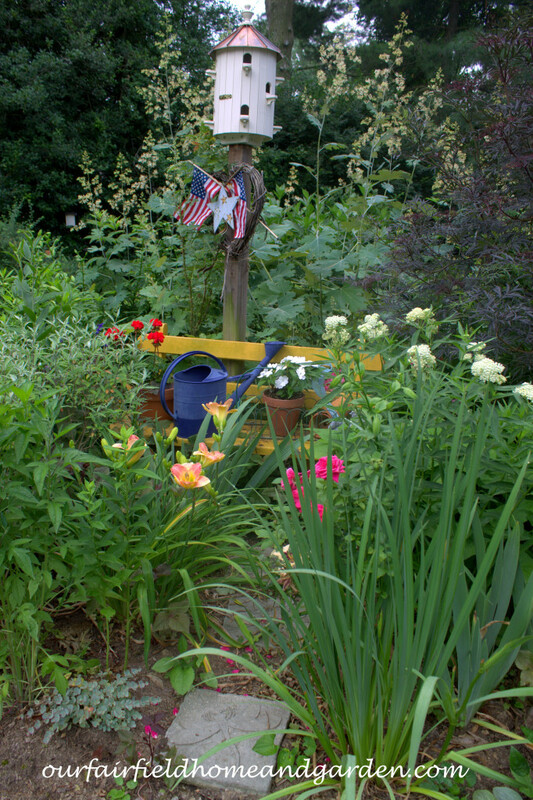 Garden Bench in the front flowerbed. Greenhouse we built last summer. Rusty Tool Arbor into the fire pit area. 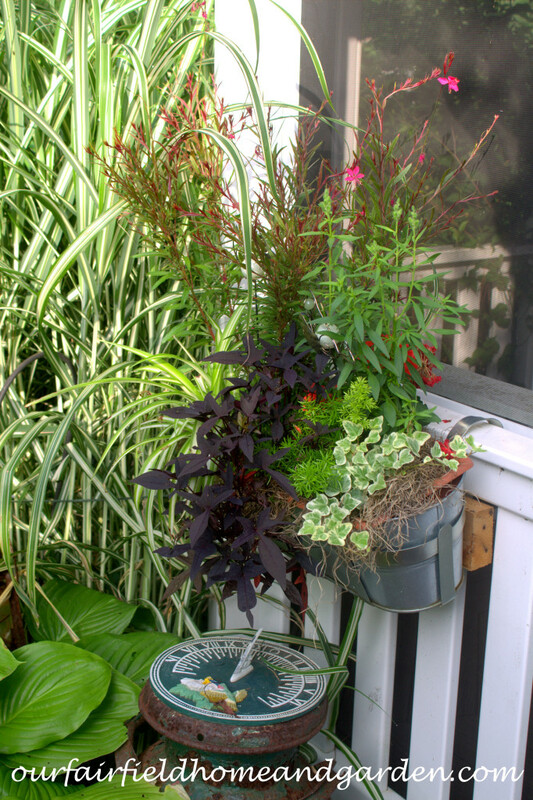 Container Plantings in an old nursery wagon. New Shade Garden made last summer to make way for the greenhouse. 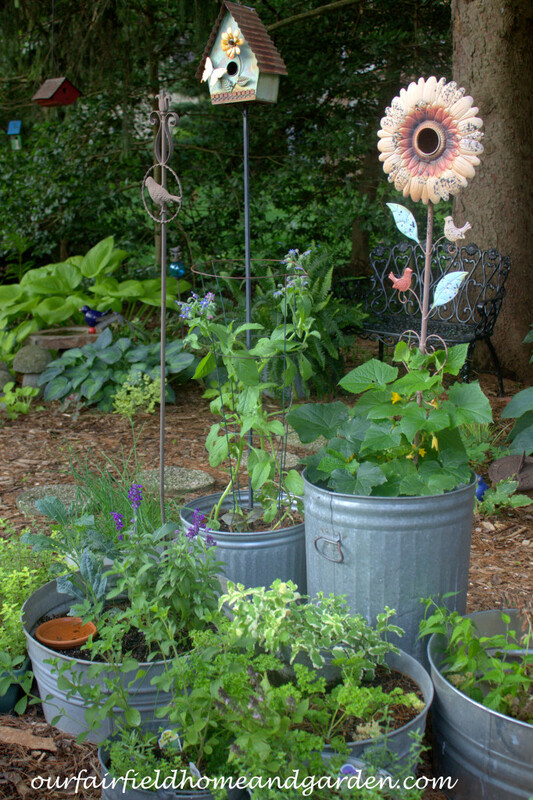 Galvanized Container Garden with herbs and cucumbers. 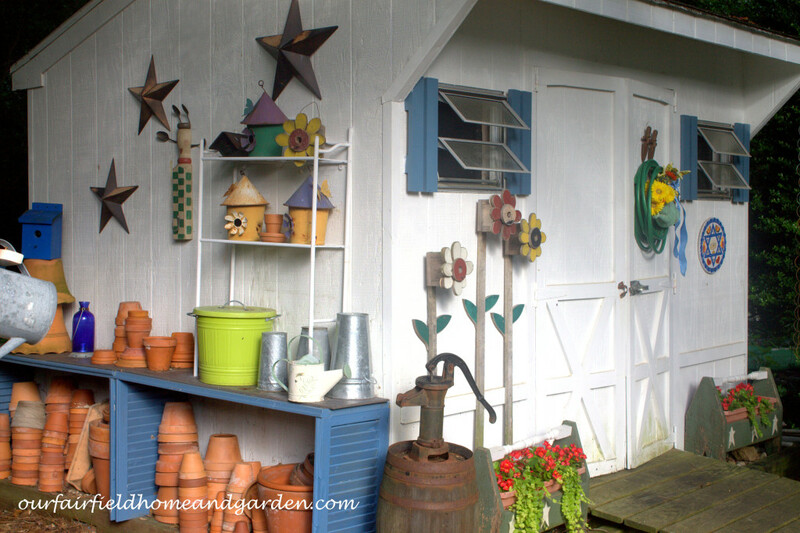 Garden Shed ~ my big summer project was getting this painted and presentable!! What a difference white paint makes! 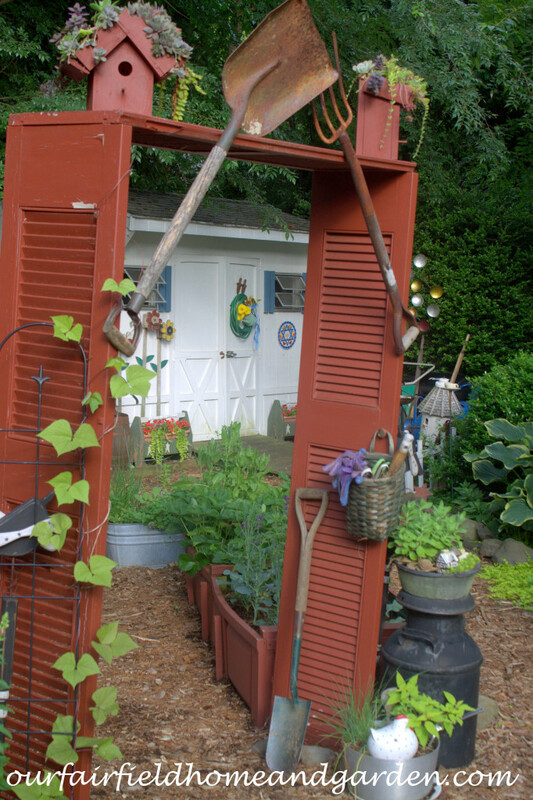 The Shutter Garden with raised beds full of veggies. 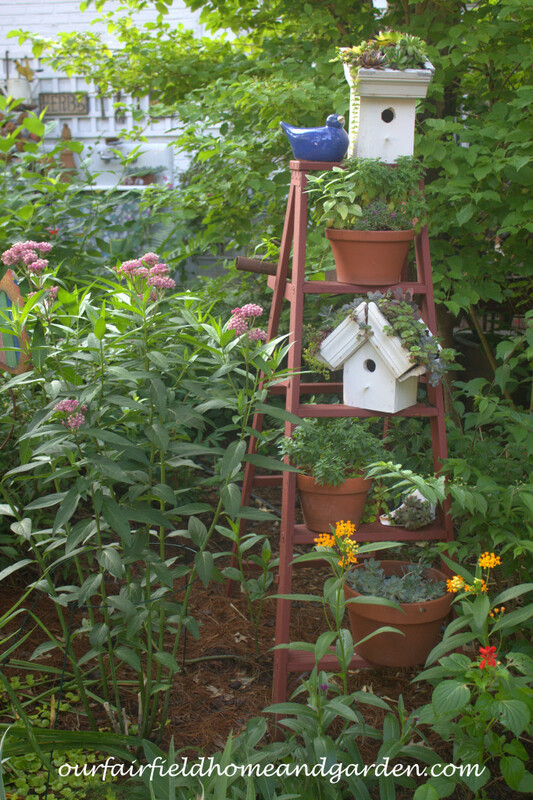 Shutter Garden Arbor and greenroof birdhouses. 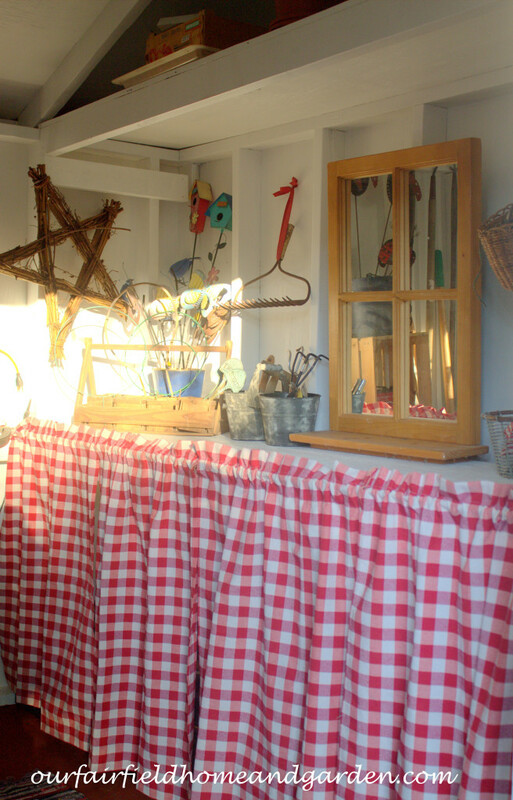 See more about the Shutter Arbor here! 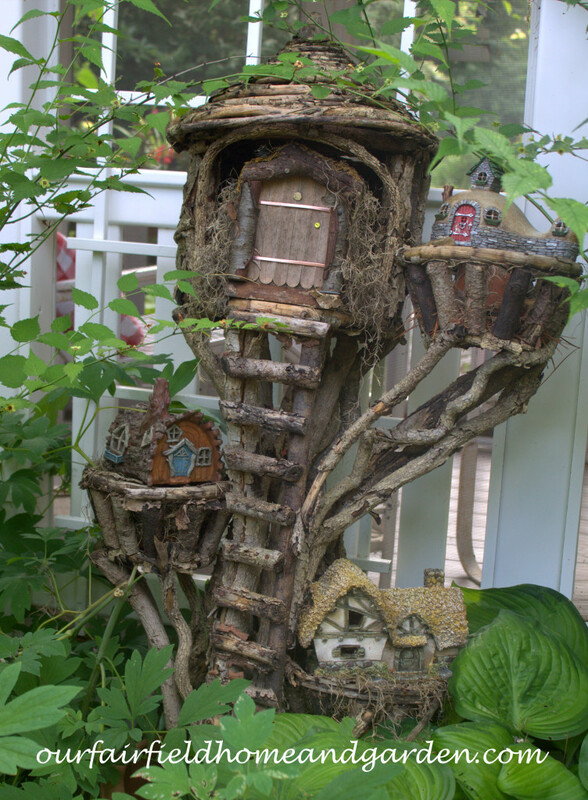 Fairy Houses for the wee folk. 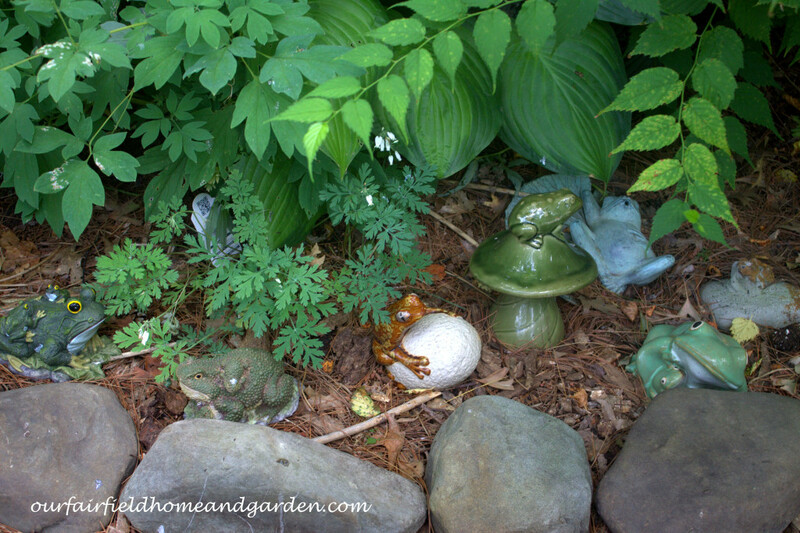 Garden Frogs, a little collection I keep adding to. 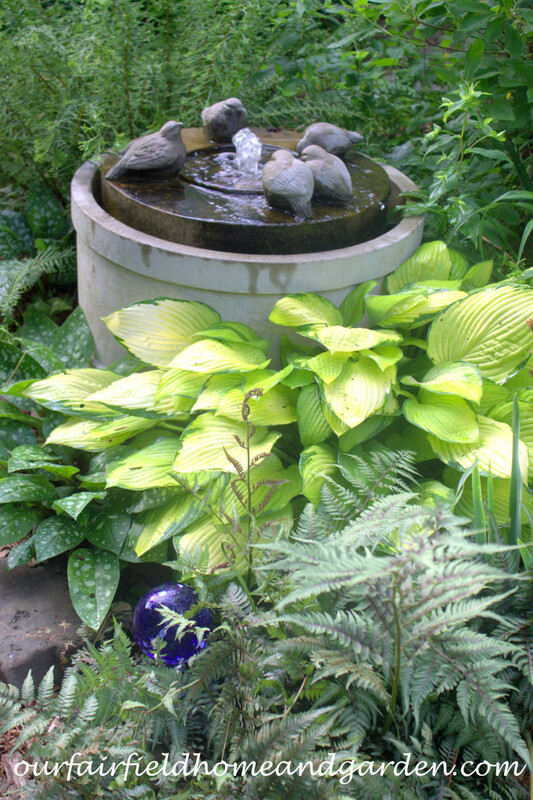 Bird Fountain nestled in the ferns and hostas. 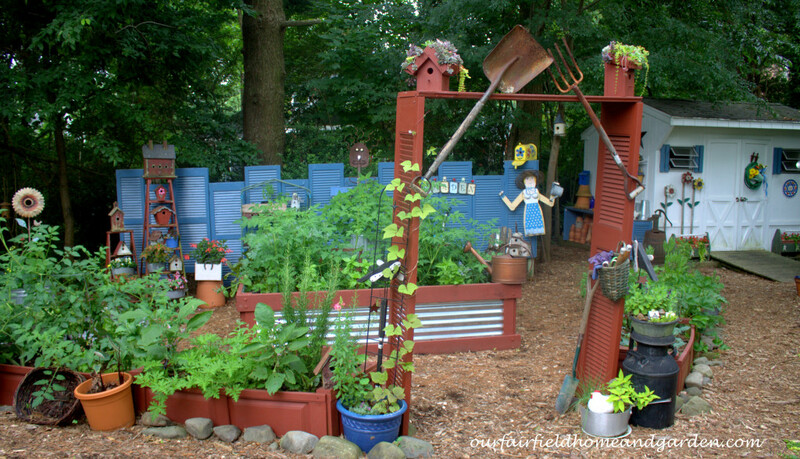 Garden Ladder with greenroof birdhouses in the butterfly garden. 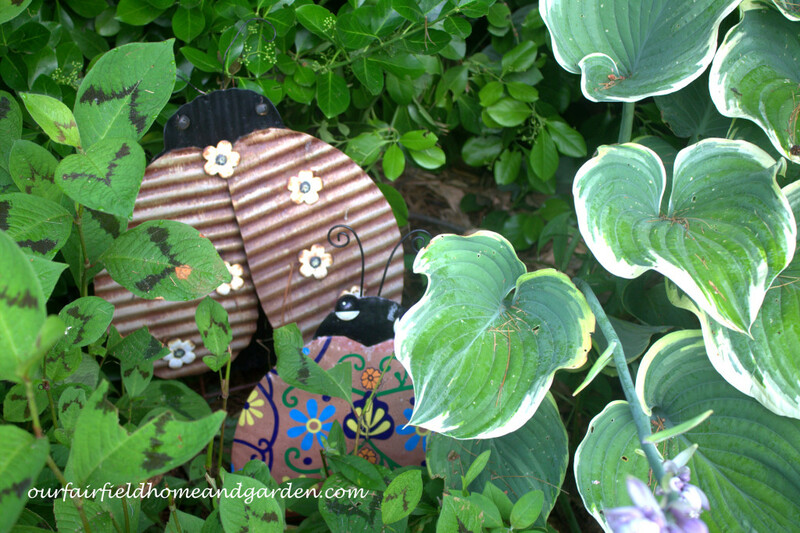 Plate Flowers tucked in the August Lily hostas. 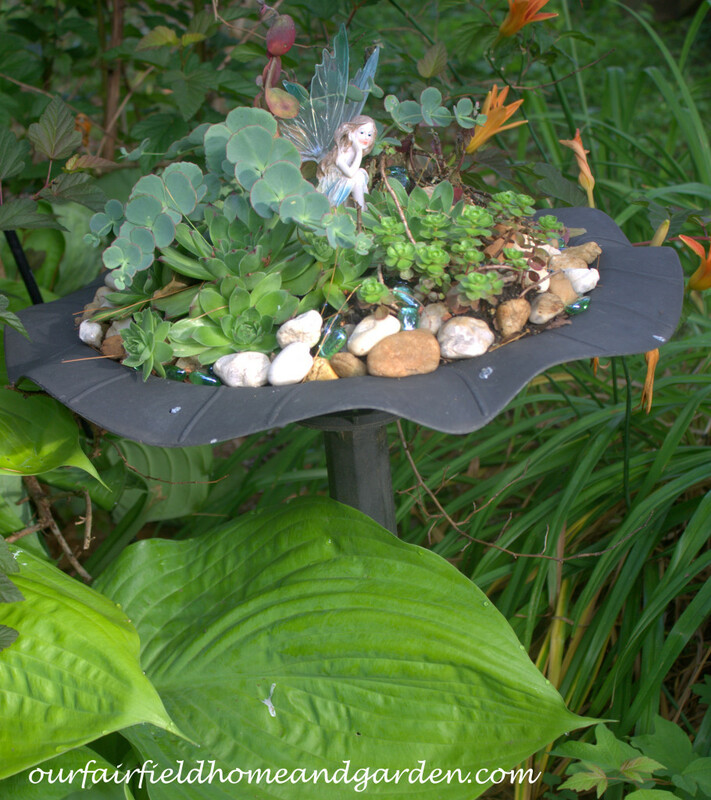 Garden Fairies in an old birdbath with succulents. 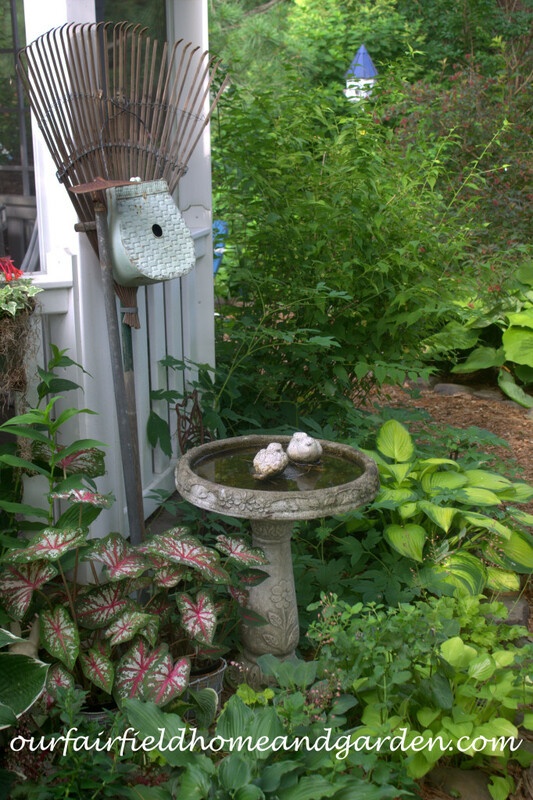 Gazebo Birdbath, Caladiums and Hostas. 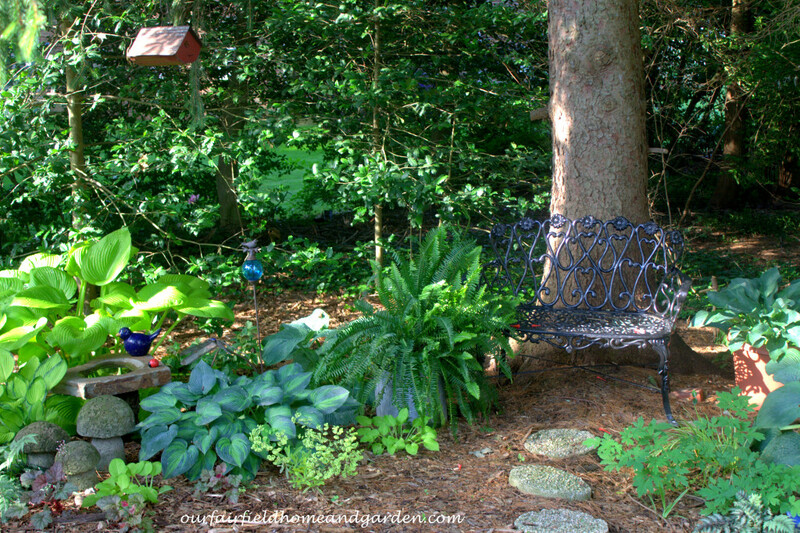 Under the Pines ~ a spot to rest and admire the climbing hydrangea vine. 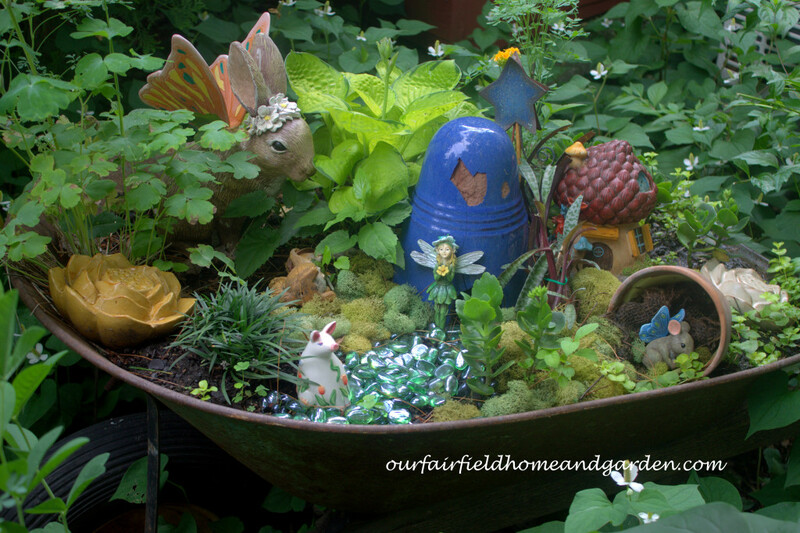 Succulent Fairy Garden in a resin birdbath found at the curb. 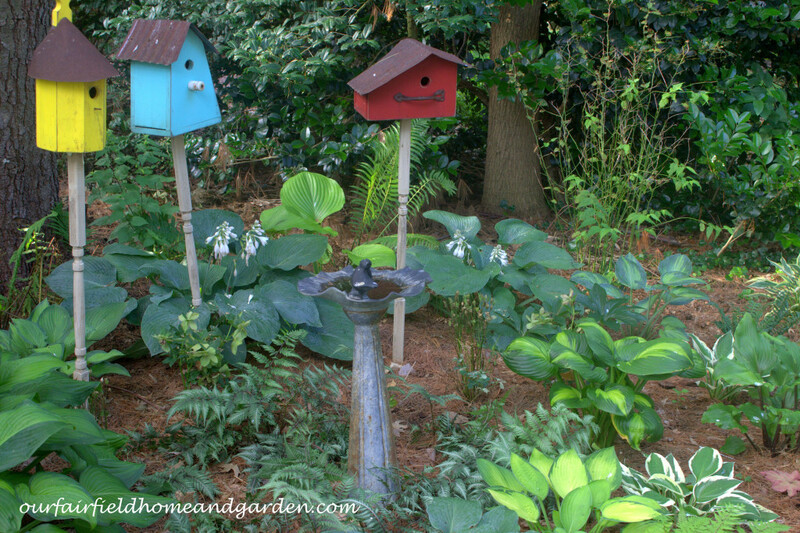 Bird Garden ~ just one year old! 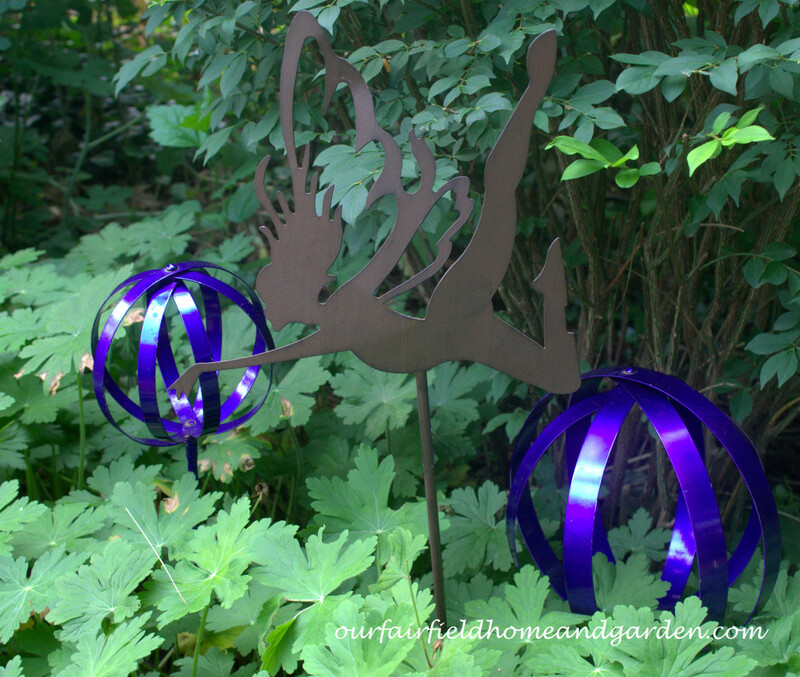 Your yard is absolutely gorgeous!!!!! Thanks for taking the tour today, Kellie! I appreciate your kind comment! Wow, just wow! I would love to take a stroll through too. Thanks for sharing. 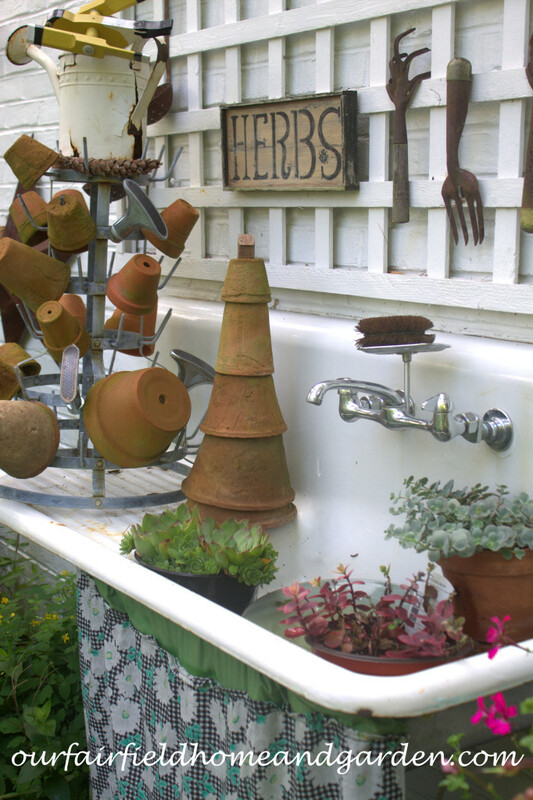 I was at your garage sale/garden tour today, and I was absolutely gobsmacked by the beauty and creativity in your garden. It was truly inspirational, and I left feeling lighter and more joyful. Thank you so much for sharing such beauty, and for providing a haven for wild creatures. I hope to tour the grounds again when you have one. Is there a mailing list one can be put on, so that I won’t miss it if you have one again? It it just lovely. 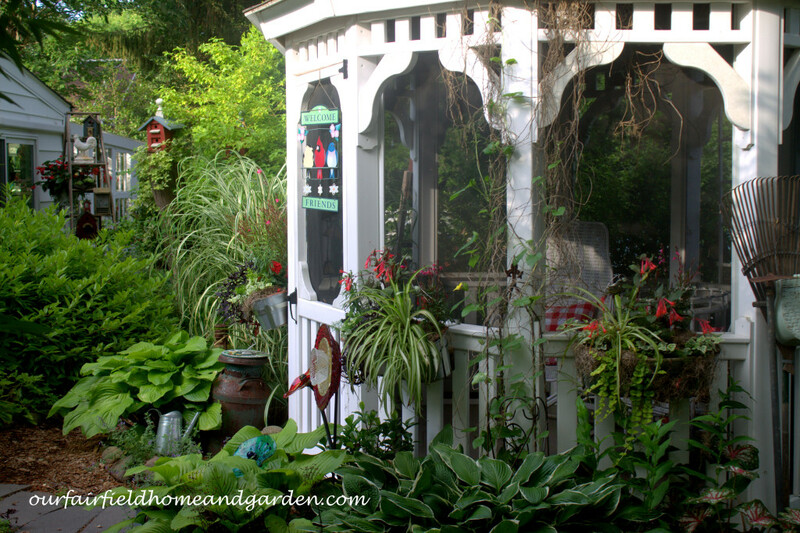 How I would love to stroll through your gardens and sit on the porch swing. Your hard work has certainly paid off. Thank you, Lyn! 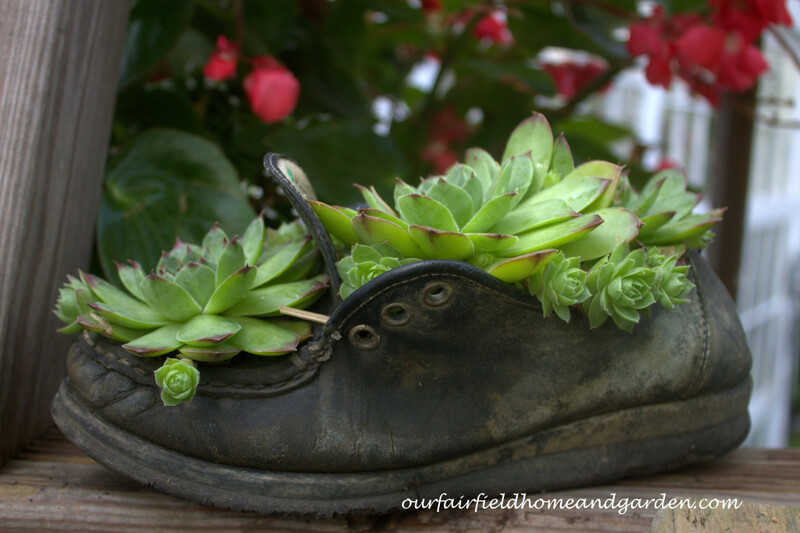 It doesn’t even seem like work when you love being outside in nature and tending the flowers! Sounds like a good idea, Donna! Always love free seeds and plants from friends! 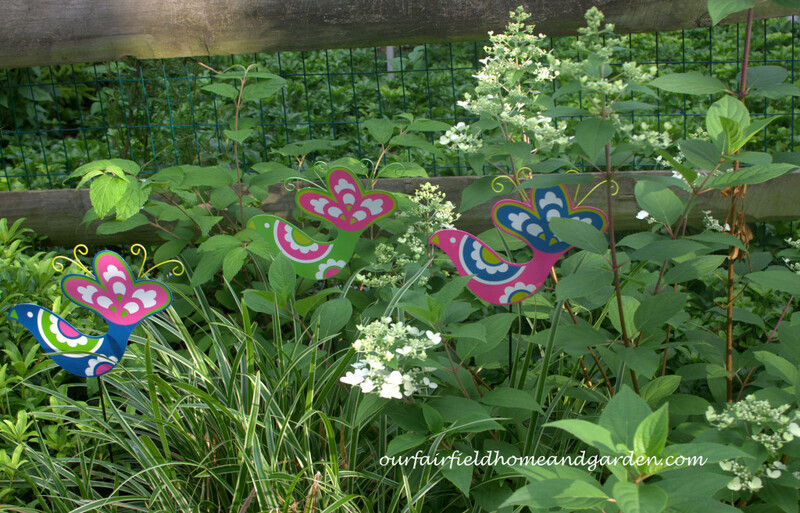 Thanks for stopping by and peeking at our garden! 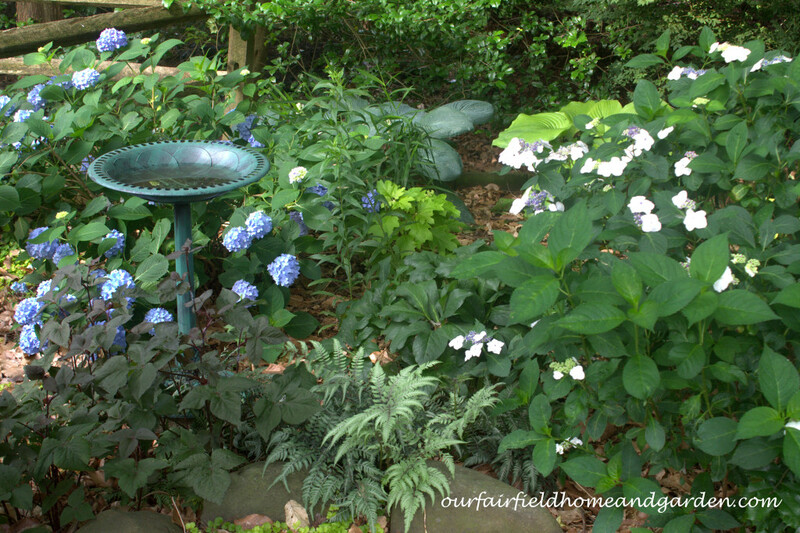 Thanks for the tour Barb … wonderful gardens! 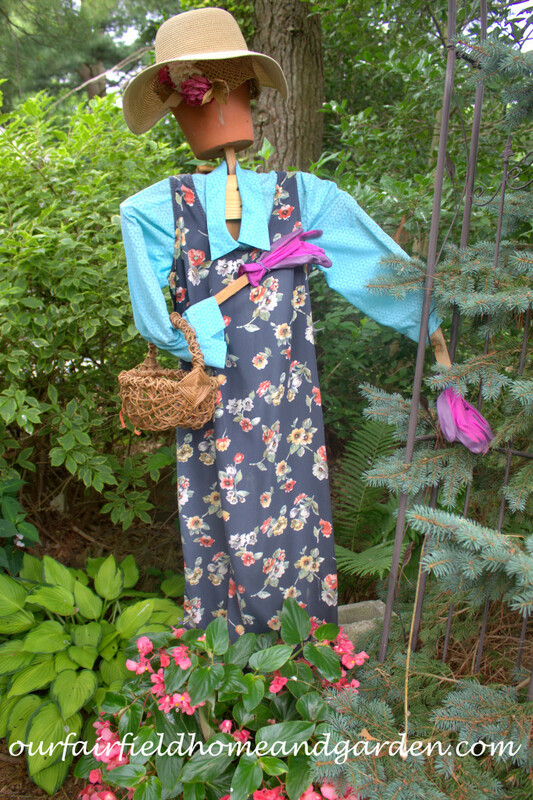 Thanks for coming by our gardens today, Maggie! You have found your niche! Everything looks so warm and inviting. 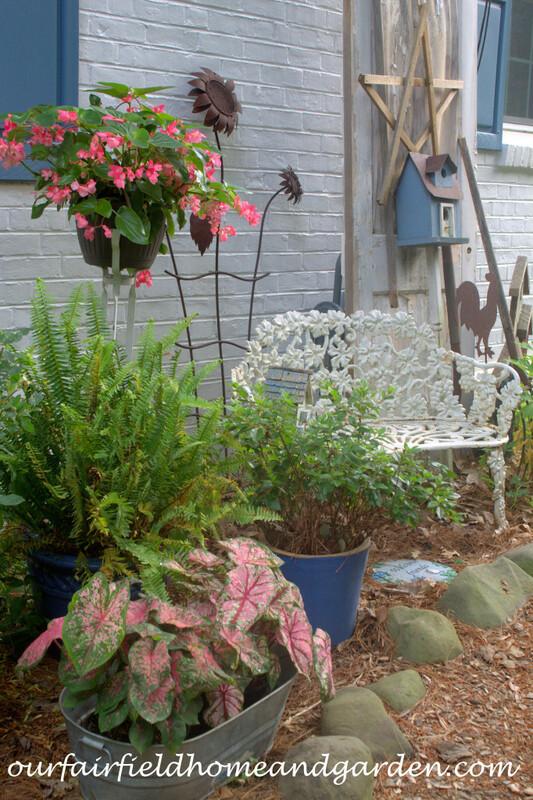 Anyone would love to spend the afternoon in your yard. 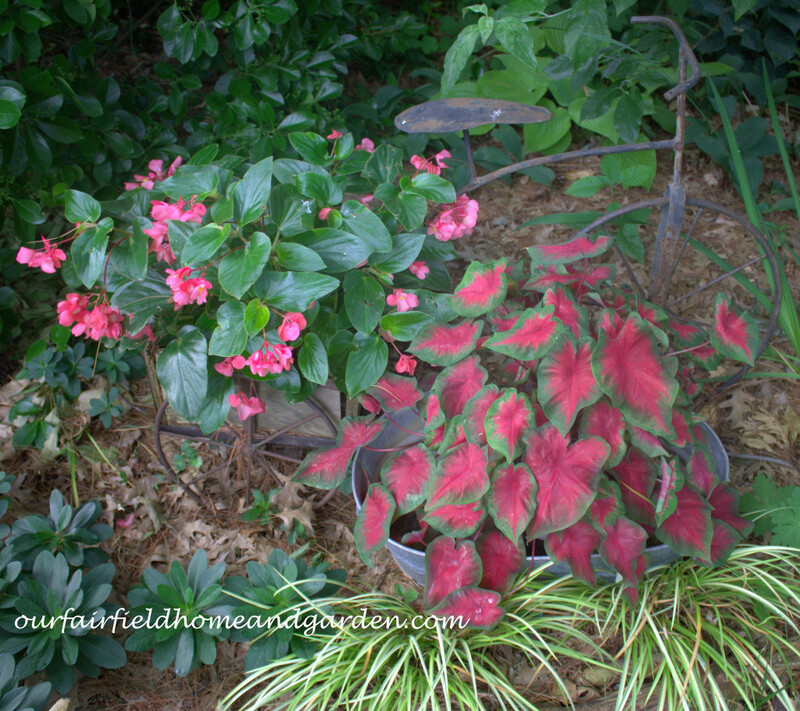 Do those beautiful pink caladiums come back every year? They are gorgeous. Thank you for labeling everything so we may borrow some ideas. You are such a generous-hearted person. Love it all!